An official of the independent National Electoral Commission attending to registered voters. Iniye Francis from Zarama community in Yenagoa Local Government Area wanted her Permanent Voter's Card (PVC) to ensure she could vote in the 2019 election. But her lack of money placed a limit on her ability to move from one location to another. Her tears and running nose could show how much she wanted it, but her empty pocket left her bereaved of the opportunity. She had arrived at the office of the Independent National Electoral Commission (INEC) at about 5:00 a.m. local time on the last day of registration. Confident that everything would be done to ensure she got her card, she was shocked to find out that she had to pay to receive the card. The young lady and other residents of Bayelsa at the gate that could not offer money were gradually losing their franchise. It was Iniye's third time of being there and she was beginning to wonder if the delay she had witnessed in her previous visits were intentional just to make sure they part with money. Many other persons there were also complaining, raising allegations against officials of INEC handling the registration process for the Permanent Voter's Registration Card (PVC). They said it had been turned to a money making venture. "This is my third time of coming all the way from my village just to get registered." "They are collecting bribe before they will let one into the premises, l only have my transport fare and today is the last day" she lamented right in front of the gate with a gate man. 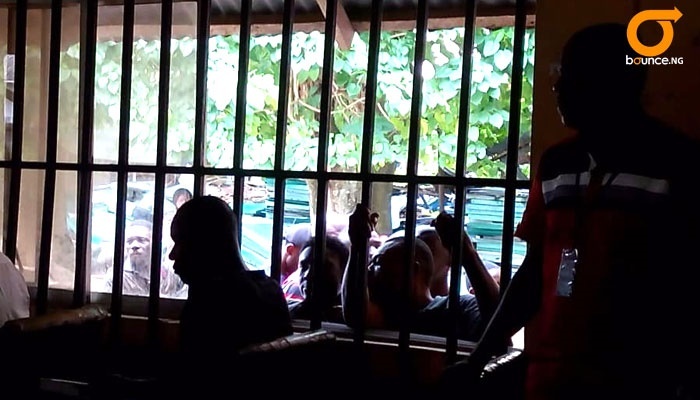 They are accusing an INEC official of Yoruba origin and some Police officers of extortion. Crying and wiping her nose with the back of her left hand, Iniye told Bounce News that "today, my number is 7 but, when it was my turn to go into the building, l was told to bring 400 Naira by that man" pointing at a slim, fair, average man of about 45 years by the gate. She said that she had been standing for over 6 hours. An engineer, Mr Adaka Konbowei, explained that he lost his wallet containing his PVC and other documents and as such, needed to re-register. He confirmed to the fact that they were being extorted. "I need the PVC desperately. "I gave a Corp Member 1,000 Naira to help me but its been 3 hours and he is nowhere to be seen," he claimed. Mr Konbowei said a police officer, whom he also approached to help him, asked for 700 Naira. "It's like the PVC is for sale," he added. A resident, Obua Franklin, narrating his ordeal said: "They are frustrating us here. "The gate man who calls out the numbers on our tag will just jump from number 6 to number 49, whom I strongly believe must have paid them some token". However, an INEC staff, who pleaded not to be named, told Bounce News that "most of the people complaining here, carry their PVC's about. "When it gets lost they come asking for express services. "I heard that one of my colleague is collecting money but I have told people not to give him anything". He then advised people who have been extorted to report and expose those involved.